tracieclaiborne.com: join me for a live webinar! join me for a live webinar! In “Pocket Page Design” we take a look at the details of creating pocket pages–from favorite configuration to approaches for solid design to the specifics of working with basic page parts like photos, title, journaling, and embellishment. Guest teachers are Doris Sander, Adrienne Alvis, Tracie Claiborne, Amy Mallory and Amber Ries. This class includes an eBook and a series of interviews and live office hours sessions with our five contributing teachers. Get It Scrapped offers a very extensive library of creative classes. If you're someone who wants to really grow in your design skills and look at your work critically to find areas you can progress in: this is the place for you! Follow this link to find more about membership! I hope to see you in the chat room for my live webinar! 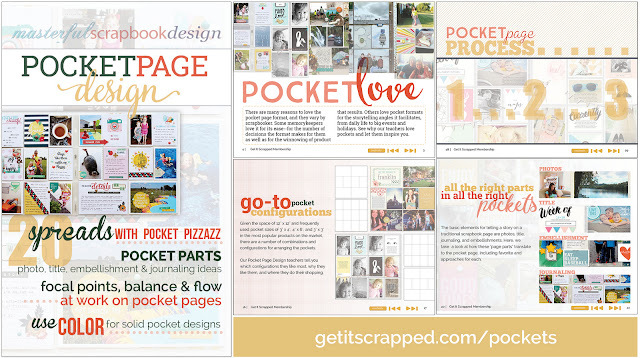 Tracie, I joined GetitSCrapped just so I could take the Pocket Design class. I was really excited about it. I just listened to you interview about 3 times and that alone has already taught me so much! I just got out my album and page protectors with a plan, it feels great! And that e-book is amazing, so much information in it. Thanks so much so far!